Did you ever dream of playing music for a living only to be told to get a real job? 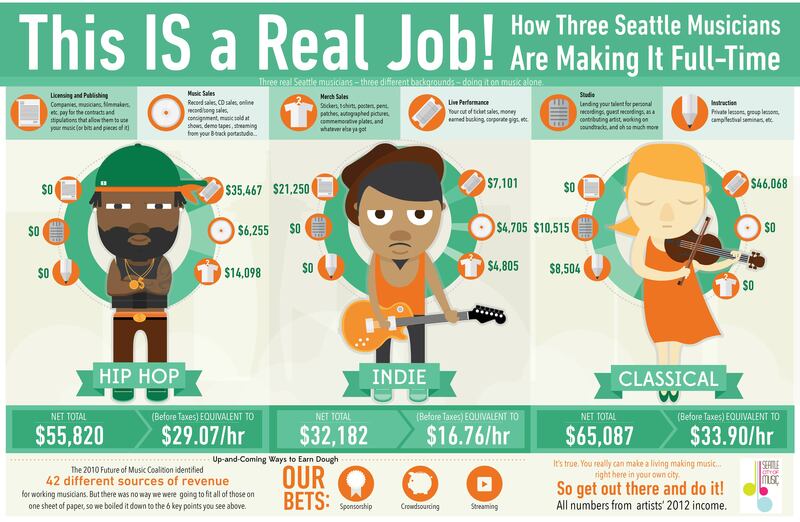 The Seattle Office of Film + Music aims to challenge that notion with its newly-released infographic that illustrates annual revenue of three up-and-coming fulltime Seattle musicians and how they do it. The infographic came to life after James Keblas, the Director for Seattle’s Office of Film + Music, was asked by a young musician, “how can I quit my day job and just play music?” Inspired by the question, Keblas reached out to other successful musicians to find out specifically how they do it. Licensing and Publishing – Companies, TV, Film, Commercials buy your music. Tip: Send out a monthly digital newsletter of your music to music supervisors with new songs ready for licensing. Music Sales – CDs, downloads, streaming. Tip: You and your fans give away one free song on social media platforms to hook folks to buy more songs. Merchandise Sales – T-Shirts, branded band-aids, condoms. Tip: You will increase merchandise sales by over 50% if you’re sitting at the table where the goods are being sold. Live Performances – Concerts and touring. Tip: Don’t dismiss the earning potential of busking. Musicians at Sea-Tac Airport and the Pike Place Market are averaging over $100/hour in tips. Studio Work – Film & video game music, studio or backup musician. Tip: Make friends with people in the tech world who need music scored for game or app development. Instruction – Teach others music. Tip: Do group lessons and get the biggest paycheck for your time. The infographic was made by Killer Infographics, an infographic design firm located in Seattle’s tech-savvy Fremont neighborhood. Their infographics are built by a team of highly talented artists. Led by Internet marketers, their staff creates viral-worthy infographic designs that get the attention they deserve.